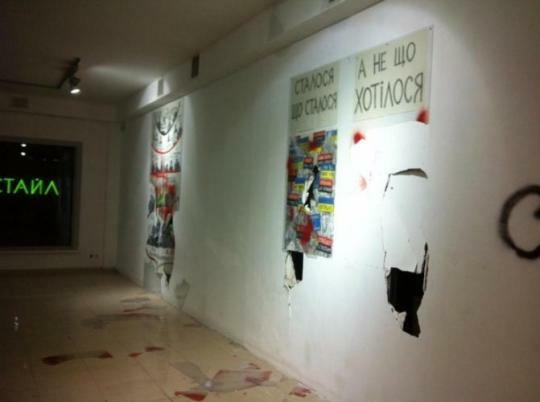 In February 2017, an exhibition of works by self-described “anarchist-artist” David Chichkan was destroyed while on view at Kyiv’s Visual Culture Research Center. A group of masked individuals broke into the Center, beat the guard, destroyed the works on view, and spray painted the walls with phrases like “Glory to Ukraine!”, “Loudspeaker of Moscow”, and “Separ”. Said an employee who witnessed the attack: “We opened the exhibition as planned, at 2pm. Immediately we noticed a ‘scout’ who came for reconnaissance, and understood that an attack is possible. We called security guard and closed the exhibition from inside. We opened only for visitors, only one at a time was allowed to enter.” But at 6pm, as a guard opened the doors for the next visitor, a group of roughly 15 masked individuals burst into the space, assaulted the guard, and began attacking the work. All of the items on view were damaged beyond repair. While none of the assailants were arrested, the exhibition’s organizers suspected right-wing radicals. In fact, there had been another violent incident at the Center a few days prior, when Chichkan was scheduled to hold a guided tour of exhibition. When the tour drew threats from right-wing radicals on Facebook, the gallery canceled the tour and closed the exhibition - but a few unknowns came to the Center anyway. After trying to break through the closed door, they damaged a banner, tore down a poster and beat up a random passerby before fleeing.